Soft is the name of the baby game. They’re soft. Their toys are soft. And their clothes should definitely be soft. Enter the Angel Dear chenille hoodie jacket. I love this thing. If you can’t think of someone in your life whose baby needs one, look harder: you have to pass along this fluffiness to someone small and deserving! A friend of ours got one as a gift and, after touching it’s ultra-softness, I ordered one for Astrid. When she outgrew that one, we got the next size up. It’s not a rocket science jacket: it’s not waterproof or even windproof. 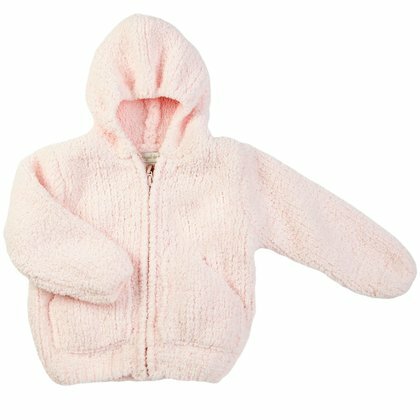 It’s just pure, fluffy fleece that keeps most of that fluff even after repeated washings. We’re not talking flat, functional REI fleece (which we also have and like) but a little cloud to wrap up baby in the car seat, on errand runs or a chilly afternoon at the playground. I take ours with us on pretty much every outing here in San Francisco. The hoodies come in a range of soft colors as well as stripes and sizes from 0-6 months up to 4T: an appropriate gift for pretty much any child and any occasion. And at $25, you won’t break the bank but people will think you did. Note: the zippers aren’t the best out there and can be a tiny bit tricky to thread, but they work just fine with an extra jiggle.